P.S. To Ben’s parents: blame the late post on Grandpa. Grandma had it ready to go before we left for Oz, Grandpa blew the upload. We arrived safely back in Perth, dropped off the van after a two week marathon of 4700 kilometers and found our way to our hotel. We spent the day cycling around the harbour, and now are going to have a wee nap before we go out for the evening to celebrate our New Year’s in Australia. Our lovely vacation is saddened by the news that my 90 year old Mom has fallen and broken her hip, and is awaiting surgery in a hospital in Lincoln. Not the best way to end her year, but we trust that she will be well looked after and the surgery will be successful. We do hope that your year ends well. Thank you all for your visits to our site, for your prayers for our ministry, and for the love and care many of you have shown to us for many years. We count it a very great blessing to share what God has been doing through us, and we trust that in the coming year, the Lord of all greatness will show His greatness to you in special ways. The campsite at Pemberton had a wonderful kitchen and very clean facilities. It was also remarkably quiet at night, which may have been why I was able to sleep till past 7! While we were setting up breakfast we listened to two kookaburras having a set-to above our heads; it sounded like a laughing contest and you couldn’t help laughing in response. We cleaned up and set off at 8:30 down a winding road towards Denmark for lunch. Just outside Walpole was saw a detour for something called a ‘tree-top walk.’ We had read in the Rough Guide that this was a worthwhile experience, so we drove up and found a parking spot – Pam physically blocking another driver from stealing it from us, much to my amazement! – and paid a very reasonable $10 for the walk. It was incredible! 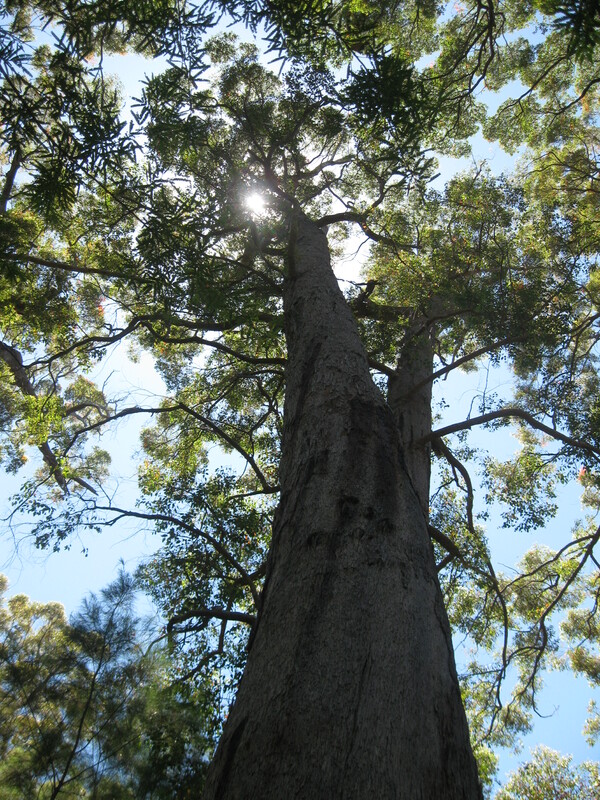 What we saw was a very old stand of Karri and Eucalyptus trees – the locals call the latter Tingle trees, a most inappropriate name for such a magnificent creation – and how we saw them is by a 120 foot high walkway that winds its way among the trees in that forest. At this height you are about halfway up these enormous structures that tower above you from their massive bases in the forest floor below. The metal walkway sways with the weight and movement of the many people walking this aerial trail, and it is more than a little unsettling. But the sight of these trees, their majesty and beauty literally take your breath away. Pictures cannot hope to do justice to the scope and size of what we saw. Lunch after that was anticlimactic, and we drove in kind of mesmerized stupor to Albany, our destination for the night. The campsite was crowded and not particularly nice, but when we broached the sand dunes separating us from the sea, the view took our breath away. We were staring at a simply spectacular view of the Southern Ocean, sparkling aquamarine under the afternoon sun, with the headlands of the bay marching seaward in the distance and the waves crashing on the foreshore in front of us. We had but one collective thought: we must swim! We returned in haste to the camper, put on our suits – cossies, in local parlance – and retraced our steps to the beach. We figured we would probably freeze to death before we got waist high, but we were in for a surprise. The water was warmer than the Indian Ocean in tropical Coral Bay, 1,000 kilometres closer to the equator. We swam and body surfed the waves for an hour before we tired and dried out under sand that was as fine and white as icing sugar. We had burgers for supper and I finally got an internet connection that allowed me to call Mom and wish her a very belated Merry Christmas. We have just two more camping nights on what has been one of the best vacations of our lives. P.S. I can’t seem to upload pictures through this weak internet connection, and will try again when we get back to Perth. My apologies, and thank you for your visits and your comments. I can’t seem to sleep much in the van, despite retiring late with a movie and a book. I was still up at the crack of dawn, doing my exercises and talking a good long walk outside before heading to the showers. I chewed up an hour and a half on these things, but Pam was still not terribly happy at being woken at six-thirty; can’t say that I blame her for that. We had a light breakfast and rolled out about seven-thirty, just enough time to get to the Dome in Margaret River for a Skype call to Jon and Nic in Canada. They weren’t home, but Jon was savvy enough to put call forwarding on Skype so we could track him down at Nic’s parents’ place. We had a lovely visit with them and Ben and Abi, who were delighted to “see” us and blew endless kisses at the monitor. Their cheery manner and happy faces have been with us the entire day. We headed back to the Caves Road through the awesome Karri forest that lines the road and made a detour into Hamelin Bay to see the ruins of jetty that once loaded these enormous trees for shipping to London, England to build the stately mansions and stores of the 19th century. The relic in the sign above refers to the jetty, not yours truly, although after this trip it is likely to be true of me as well! 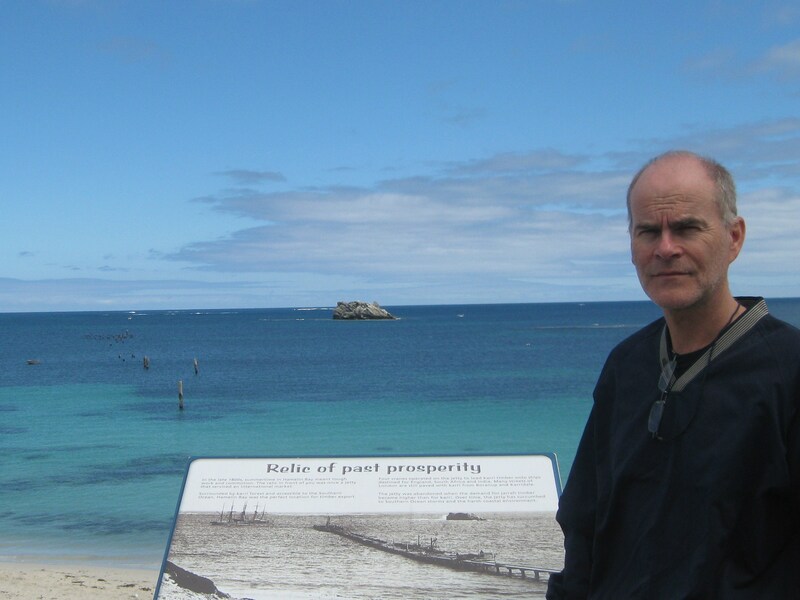 We also made a trip to Cape Leeuwin, the most south-westerly point of Australia where two Oceans, the Indian and the Southern meet. The drive across to Pemberly was uneventful and uninteresting, but the forests around Pemberly were a different matter. We had a lovely tour of the Warren Forest, filled with old growth Karri trees, some that were clearly more than 500 years old. After an unsuccessful and ill-advised attempt to take the van down a virtually impassable road to the river, we back-tracked to a much more civilized road that had a sweet little tea house where we could sit on the patio and watch the breeze move these magnificent trees in a gentle and endlessly varied dance. Pam’s patience and watchfulness was rewarded with our first sighting of a mother kangaroo, her joey clearly visible in the pouch beneath her front paws, slowly making her way across the back field. They remind you of deer in their alert grazing, but their tails give them a clear advantage in providing both balance and locomotion, freeing their front paws to assist in the feeding process. We returned to our campsite and had a nice steak dinner and did a load of laundry. We settled into an evening of reading and blogging, quite happy with our lot in life and very grateful for the technology that allows us to visit with our children and grandchildren from the other side of the world. I stepped out of the van this morning and found myself staring into the curious eyes of a kangaroo. He didn’t seem much fussed and continued browsing on the grass at his feet. I debated letting Pam sleep, but decided she would much rather see a kangaroo and woke her with a call. He scampered when I reached for the camera, but not before we had both taken a good long look at each other. Pam cooked us a breakfast of eggs, ham and onions and once again we hit the road early, heading out for the town of Margaret River. We arrived in time to do a little shopping at a local farmer’s market, and filled in what was missing at the local IGA. We eyeballed an internet cafe for future reference, but the town was a little too touristy for our tastes, and we headed across country on some single lane back roads across some gorgeous hills and valleys lined with orchards, cattle and vineyards, some things we hadn’t seen much of further north. We parked for lunch overlooking a place called Canal Rocks, a rocky intrusion into the Indian Ocean, weather and water beaten, and looking beautiful under a clear blue sky. We had to position a mosquito net across the tailgate of the van so we could see out without being pestered by ‘face flies’, these annoying little flies that are so desperate for moisture in this dry climate that they immediately go after your eyes, nose, mouth and ears. The netting was a charm, and we had a very pleasant and unmolested lunch of ham and feta salad. After lunch we headed for the Ngligli Caves, an extensive limestone network that took us an hour to cover. It was well-managed and well-lit with a strong catwalk and informative displays. It was neither wet nor bat-infested, two things that we both hate, and in fact reminded us of the Beatushollen Caves near Interlaken. 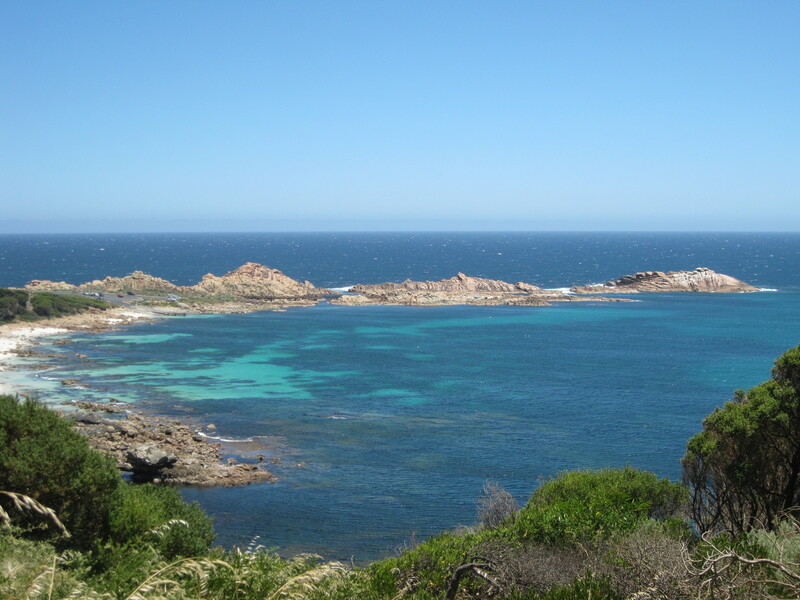 Feeling a little sleepy, we drove to Cape Naturaliste and parked in the shade for a wee kip. Then it was on to some local wineries to sample their fare and talk about varieties. Australia is justly proud of its wines, and exports to much of Asia and many parts of the rest of the world as well. We ran into folks from Italy as well as Ireland and enjoyed the scenery and gentle ambiance as much as the taste of local flavours. Then it was back to the campsite for a quiet evening of blogging and reading. I woke early in Freemantle thinking about calling home. I wasn’t going to let our last chance at a reliable internet service go without making another effort. I did some brief exercises, went out to the van and took up some coffee and milk and had it ready by the time Pam woke. Thus equipped we paid the 11 Aussie dollars to get the internet in the room for an hour so we could call the kids. Jon and Nic were first, but although we left a message on Jon’s phone, there was clearly not much hope of getting them that morning. We found out later they had gone skating. We had better luck with Liz in Calgary, catching both Liz and Greg shortly before they went out to Greg’s folks for a Christmas meal. They both looked happy and relaxed and looking forward to a family meal. Greg’s folk’s just bought another place in Phoenix, but neither Greg or Liz can afford to go there this Christmas. Then we called Dave and got an equally cheerful visit with him. He had delivered the Christmas gifts we had sent to the three of them and was planning on going to Greg’s place as well and had a couple of other Christmas invitations to look forward to as well. We tried Jon and Nic a second time, but no joy there. It was too early to call Mom, but Pam put in a call to her Dad, who was delighted to hear her voice. 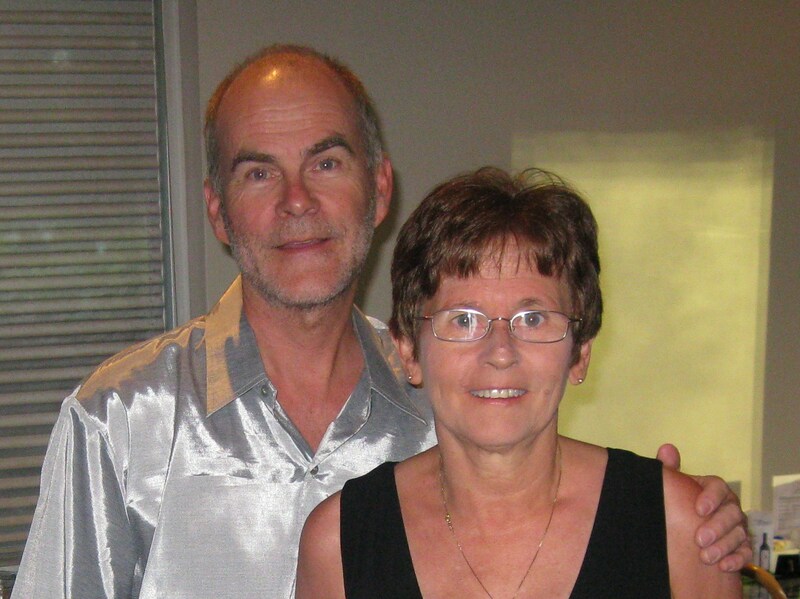 The nerve pain in his head had miraculously abated, leaving him pain free for the first time in years. Many of the family had been able to get together at Christmas at Ray and Diane’s new restaurant in Ipperwash. We praised the Lord for both of these answers to prayer. The drive south from Freemantle was a real joy. Pam found us some really lovely roads to drive, free of traffic and full of interesting little towns. 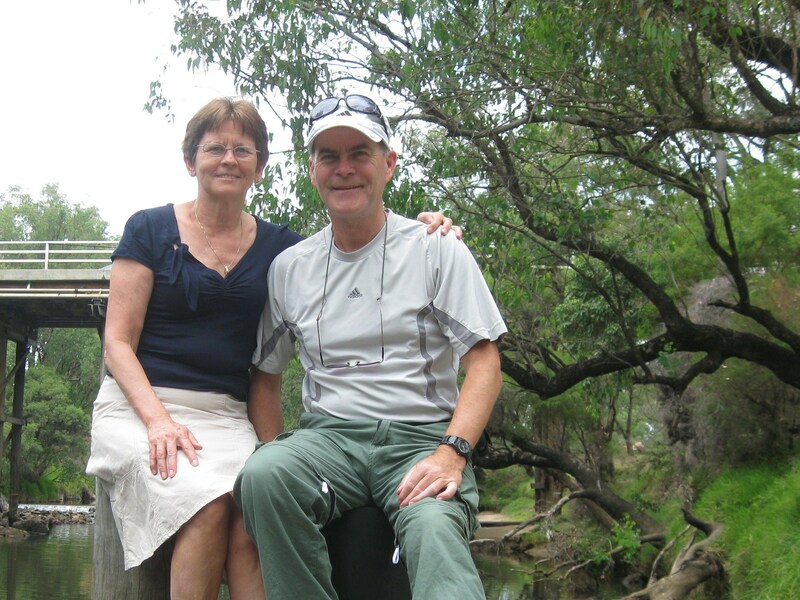 We stopped at one called Pinjarra with an old church and a wooden bridge over a verdant grass-lined stream. Lunch was hard to come by on Christmas day, and we made several stops in vain before we found a little deli with some amazing meats pies. We split a beef and Guinness and chicken and vegetable in the lightest flaky crust. We bought two more for lunch tomorrow. Banbury on our drive south had a beautiful drive along the ocean front and we stopped for a short walk on a completely deserted beach. Busselton a little further south had a tacky beach with an enormous pier and four young kangaroos on the grass entertaining the tourists. The drive from Busselton south to our campside went through a tree-lined road that wound through bucolic vineyards that looked much the south of France. We marked a couple for further exploration tomorrow. The campsite itself was set among the trees like you would find in Canada, and like all of the sites we have been to in Oz, was clean, well-run and quiet. The Aussies clearly love to camp as much as we do back in Canada and they take very good care of the natural environment. We have seen no signs of litter or vandalism anywhere at these sites, and everyone cleans up the kitchen and dining areas as if they were living at home. We set up camp quickly on a very nice site and went to bed very happy on Christmas Day. The Lord is good to us. Geraldton proved to be a nicer stop than we had bargained on. The ocean was close, and as wild as it has been up north, with a wicked rip tide that scared us off an evening dip. The chairs were a nice addition to our evening meal, and we had another early night and got up early and we out of the campsite by eight. The drive to Perth was increasingly pleasant, the scrub of the north giving way to wheat fields and trees. Traffic was still light, and we drove through Perth without any trouble, thanks to Pam’s unerring navigation. I don’t think we have made a single wrong turn for over a week. Perth is a very nice town, sun-washed and clean, and Freemantle was even nicer, with older buildings well-preserved and narrow streets that discourage traffic and invite pedestrians. 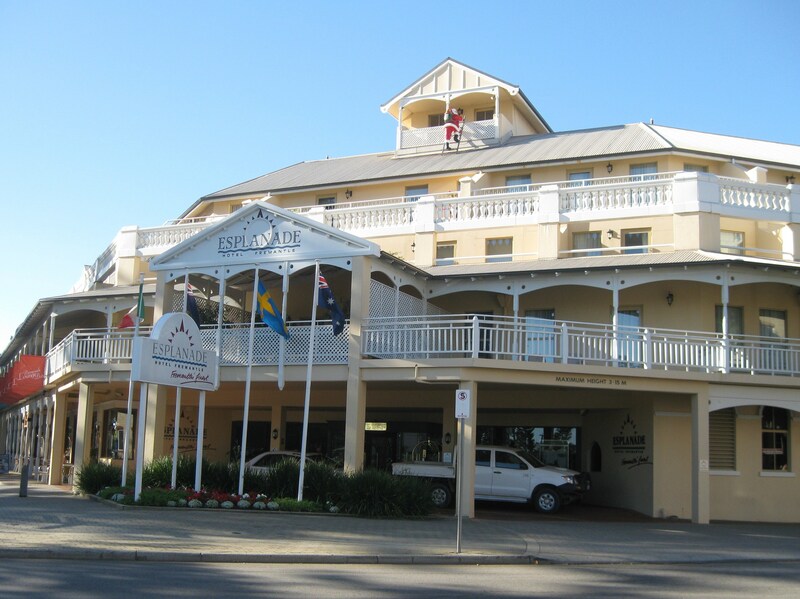 We stayed at the Esplanade, a poor choice as there were plenty of B&B’s with more character in the neighbourhood, and the staff at our hotel were snooty. But the town itself was charming and we went out for the evening and quite enjoyed ourselves. We had eggplant pakora at the Maya and olive/salami pizza at Mad Max’s. We met a couple from Malaysia at the first place and a lady from Denmark at the other and had a pleasant evening. The lattes at the Dome were a bust, far too sweet and much too small. Worse yet the internet, the only reason we went there in the first place, was patchy and we spent a frustrating half hour trying to call Canada and England. We finally gave up and retired for the night.